Review The Witness | Let’s go back in history, January 2016 the Witness comes out for PS4 and was critically acclaimed by many gamers and review sites. Now, Xbox One gamers can finally play it too. But, will it be a disappointment or not, Let’s find that out in this The Witness review! Navigating the beautiful island is done in a 3D view. The things you’ll see are absolutely stunningly gorgeous. 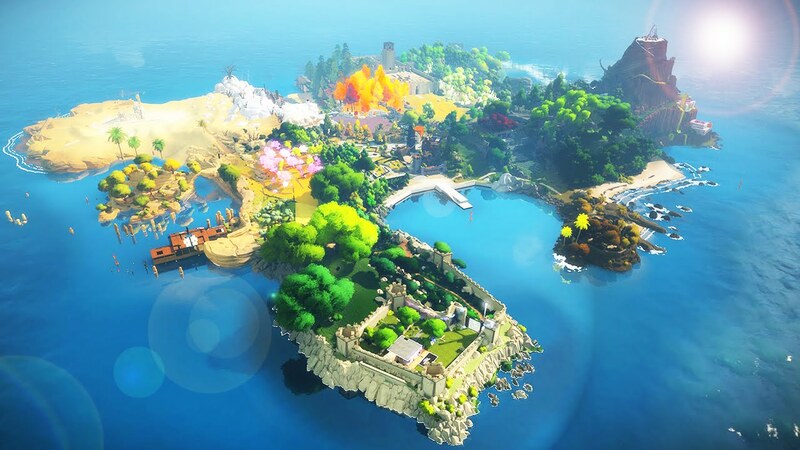 The Witness is definitely on the list for best looking Xbox One game. The puzzles are done in a 2D-view but you sometimes have to consider the 3D environment. It starts pretty basic, but you’ll have to find everything out yourself. The game doesn’t hold your hand and throughout the game more rules or challenges are added. Making the lines required for the solution becomes harder and harder, but you will never lose your motivation to continue. Exploring is a big part from The Witness and while doing so you’ll find audio logs with famous quotes or find hidden “art” that solves the mystery from the island. That mystery about the abandoned island was a big motivation to continue The Witness. It seems that every single object and item found in the world has a bigger meaning but finding that meaning isn’t simple. The more you play, the more questions come up and finding the answers is a fun time-consuming task. Coming up with the solution for some puzzles are very satisfying, you will curse for not finding the obvious answer sooner but that’s the fun part about the game. And believe me you will scratch your head a few times about what the hell you are missing, but never fear because the answer is always near you or in your viewpoint around the puzzle. I have to be honest and say that without my girlfriend I was going to be stuck on a few puzzles. That’s nothing to be a shamed about, I’m pretty sure she didn’t find the solution for some stuff I found rather easy. It’s all about perspective and that makes The Witness a perfect co-op game even though you only play with one controller. Let me be clear, I played AAA-games with less content and a shorter gameplay experience than The Witness. But still, the €40 price tag shocked me in the beginning. If it’s worth that money or not will depend from player-to-player. I can only say that I wouldn’t be disappointed if I bought it and spend my hard-earned money on it. Score: 95% | The Witness is a fantastic experience that everyone should play and love. Great looking graphics are walking hand in hand with fun and challenging puzzle gameplay.